Port Aransas is where fun just comes naturally, and during the slower winter months the locals and vacationers from across the country look forward to lots of Whooping Cranes, plus hundreds of bird species including the American White Pelican, Northern Shoveler, Ruddy Duck and American Goldfinch. 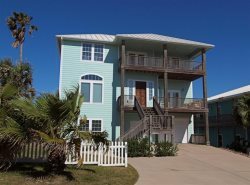 Your fun at the festival should begin with an affordable vacation cottage in Port Aransas. This tall-standing and high-flying bird visits the Gulf Coast during our winter months after migrating form northern Canada. The Whooping Crane's migration route is more than 2,000 miles and usually begins in October with arrival on Mustang Island while the rest of the country is in deep winter cold. These beautiful birds can live 20+ years and while considered to be naturally rare, their numbers have gone from about 10,000 at the founding of our country to an estimated population today of more than 400. The whole community comes together to help you enjoy the festival. The Port Aransas Civics Center and the very popular Birds Nest Trade Show at the Civics Center in downtown Port Aransas are the epicenter of everything Whooping Crane. Also, Tradewinds Vacation Rentals can provide accommodations in one of their affordable vacation rental homes... perfect for a small group attending the festival.